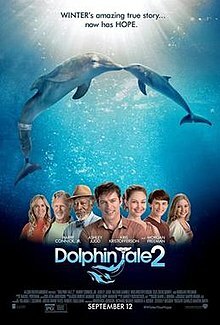 In this family-friendly sequel, Winter’s story continues when her dolphin companion dies, and her condition is deteriorating, so the people at the Clearwater Marine Aquarium, including Sawyer, the boy who discovered Winter in the first film and serves as the main character in both films, do their best to help her. Soon a baby dolphin named Hope is found and rescued, and Winter and Hope form a unique friendship. Dolphin Tale 2 is a fun family flick that both kids and parents can enjoy. It’s a cute movie that does not disappoint much. I don’t think it was better than the first one, but I still liked it. It’s problem is that some parts just feel to much like the first one, and it feels like the same movie twice. I think the cast was good, except I thought Hazel, the girl who is Sawyer’s friend, was annoying at times. Our main story is supposed to be Winter and Hope, but that only happens for the last half hour of the movie, and I wanted more of Hope. Overall I think Dolphin Tale 2 is a cute family film that is enjoyable but feels too much like the first at times. This entry was posted in Drama, Family and tagged clearwater marine aqaurium, dolphin tale 2, hope, winter soldier. Bookmark the permalink. I really enjoyed the first one a lot and I’d love to watch part two. I remember that it had some important values like friendship, dedication, self sacrifice for a good cause, etc. This is the kind of movies that I always enjoy.